It always feels like as soon as the turkey settles & the Christmas decor goes up, a new Holiday countdown starts and it’s time to find the perfect gifts for our favorite gals; which can instantly feel overwhelming. Take a deep breath… because I want to take you on a gift guide journey to some of my favorite shops in KC, and show off products I personally love to make this holiday season a breeze! First up, Made in KC! A favorite for a reason, this shop aims to bring local artisans to the people of Kansas City & throughout the metro. From baseball caps to jewelry, blankets, skincare, candles, clutches and more, they make it easy to shop for everyone on your list; ranging from Grandma, your boss or a sweet neighbor. (Seriously, they have over 200 makers housed at their 3 locations!) I’m not sure the last time I actually left without something for myself too, and I’m not even a little mad about it. 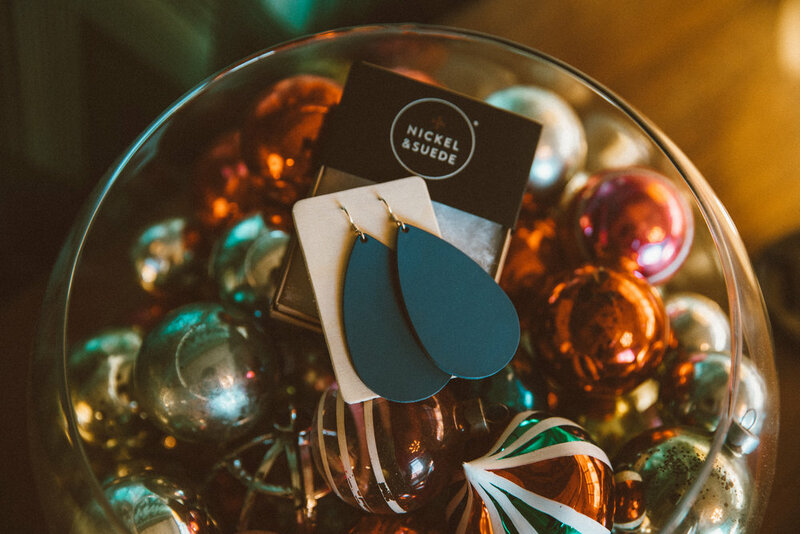 Nickel & Suede earrings from Made in KC. Next, let’s venture to Sage Center KC! This yoga studio is home to one of the prettiest little retail spaces in the Crossroads. 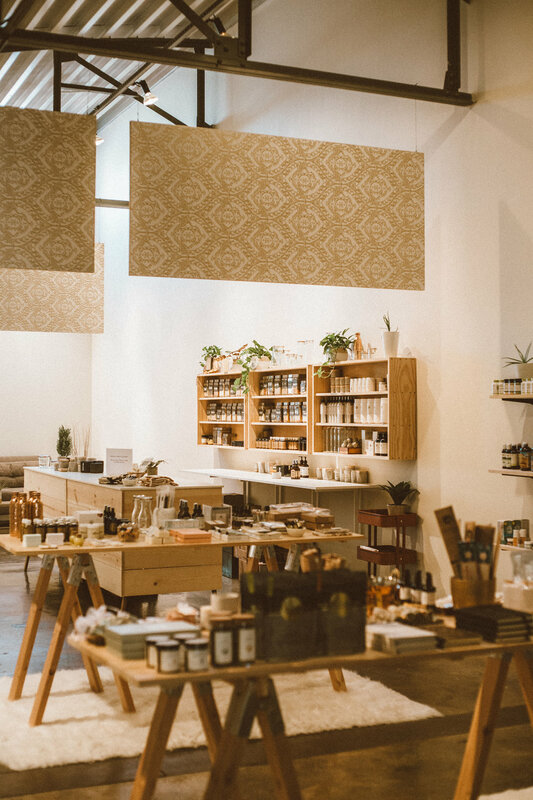 Filled with teas, skincare, sage bundles, crystals, notebooks, (and much, much more), this is a new favorite spot for me to come shop products that are more of a treat, and others that I use on a daily basis. I highly recommend their cute single packs of bath salts. They smell wonderful and make great stocking stuffers or small add-on gifts for friends + family alike. 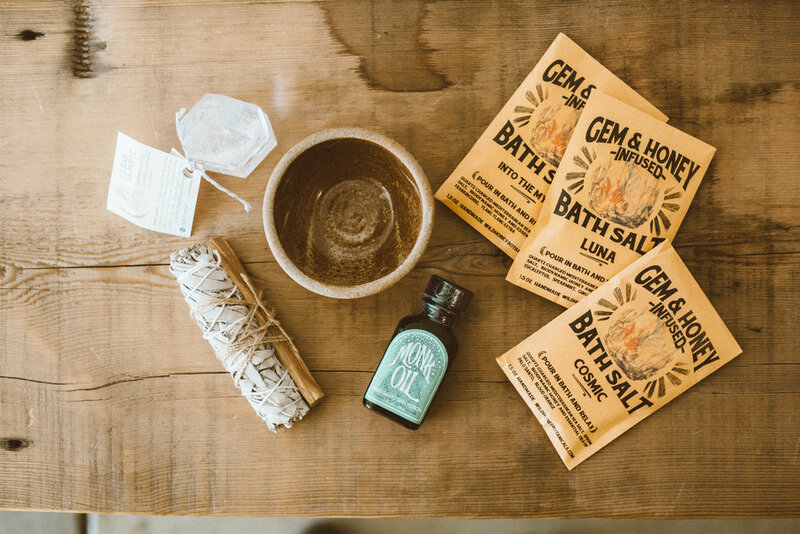 Bath salt packs, sage bundles and more from Sage Center. Rose gold clogs from We Are Sincerely Yours. Here we go, to We Are Sincerely Yours! This cute shop is home to some of my favorite little holiday cards and trinkets, (as well as a pair of rose gold clogs that I cannot seem to get out of my head). 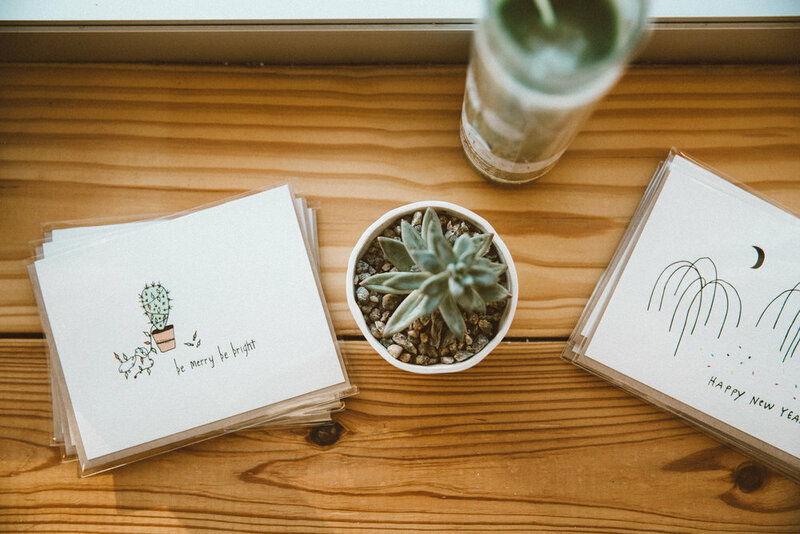 I find it really special to still buy cards for loved ones, and the selection at Sincerely Yours is one of my favorites in town. Plus, they are constantly getting in reclaimed vintage garments & goods, which is something I personally love getting to look through! Cards at We Are Sincerely Yours. Succulent bar at Urban Provisions. Next on the list, Urban Provisions! It is impossible for me to visit without taking home a tiny new plant from their succulent bar (I am not ashamed), and they sell the coolest little boxes and planters to gift them in. UPKC is also home to some of my favorite local jewelry vendors, and the new setup of their merchandise alone is well worth the visit. So thankful for this gem in the East Bottoms! Local jewelry at Urban Provisions. Next up, Etiquette! This gorgeous space is home to organic facial treatments, eyelash extensions, face & body waxing, as well as a retail space with skincare, makeup and nail polish. This staff is so knowledgeable in their craft, and I cannot wait to come back and experience more of their services. I am also not going to lie to you... I definitely couldn’t leave without purchasing a new natural lip color and polish! They curate some of the most uniques products. Now, on to Tyler Kingston! Located in NKC, this is one of my go-to shops for home decor and accessories. (Because, there is true beauty in being able to buy a beanie at the same time as a new decor pillow, amiright?) They also carry Hammerpress cards, ornaments, and have an adorable baby section for all the new mommas you might have on your list! I highly recommend checking out their selection of incense & ceramic holders as well– they’ve quickly become one of my favorite household staples. And last, but certainly not least, Dear Society! This shop is one of my favorites to go in when I want to pick up something special for a girlfriend, (and they just started carrying Shop.Bando, which is a brand best known for their gal pal feels!) From sweet little enamel pins, bath salts, and their Baggu purse selections, you will win major gift points this holiday season. There you have it! A few of my favorite places around Kansas City to do a little shopping for your best gals. I hope this guide finds you just in time for the Holidays, and makes gifting just a little bit easier!